According to the calendar, there's still just over a week of summer left. According to the weather, fall is here. So are the tomatoes--FINALLY. We planted them earlier this year in hopes of being able to eat them earlier. The only one who got to do that was Mr. Groundhog. Apparently he didn't like the pickings on the farm behind us and has been dining on not only our tomatoes, but on our neighbor's tomatoes, too! And the tomatoes aren't that good this year, no doubt due to the wet summer. They seem to start to rot before they're thoroughly ripe. So ... we're cutting out the bad bits and eating them anyway. And why is it they all ripen at the same time? Now we have a glut. We've been eating a lot of them with seasoned rice vinegar, or just with salt and pepper, but here's a recipe that uses a lot of tomatoes at one time: Panzanella (otherwise known as Italian Bread Salad). 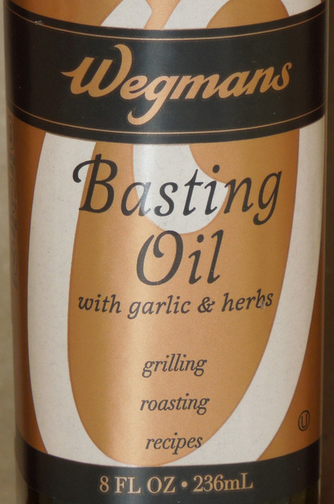 Instead of plain olive oil, I used Wegmans basting oil (which has garlic and other herbs--that mostly seem to be parsley; it's de-lish!). Haven't got a red onion? A sweet onion will do. We had a basil calamity earlier this summer (drown by a rainstorm and then I didn't know the planter where I was growing it was full so it didn't get emptied for almost a week), but it bounced back. I love basil so I added about 20 basil leaves. Didn't hurt the salad one bit. Have you got any recipes to use up tomatoes? I LOVE Panzella. I just made some last week. Mine was super simple since I did not have a lot of ingredients on hand...just tomato, day old Italian bread cubed up, olive oil, salt, pepper, fresh parsley and fresh basil. Delicious. My favorite way to use up tomatoes is to slice them in half (if they're small) or quarter them (if they're larger). Toss them with olive oil, salt and pepper. Place them on a baking rack on a large cookie sheet. Preheat the oven to 250 (not a typo, that's 250 degrees) and bake them for about two and a half hours on that low, low heat. It slow roasts them and just creates the most delicious flavor. I can eat these plain, or with some nice Italian bread. Sure gonna miss fresh tomatoes! Looks like a good recipe, Lorraine. I'll have to try it. yum! especially with fresh produce. My Dad used to grow the best ones in Rochester. Here NE Arizona I did have a pretty good crop of small ones. Thanks for posting. This looks fabulous and I can't wait to try it. I have a home-made cream of tomato soup recipe (somewhere) that uses Half and Half and a touch of white wine. I just need to find it, I'm glad you talked about tomatoes today. This has inspired me to dig out that recipe! I have a glut of tomatoes right now. I am going to try this today! Thanks for the idea. Next year I'm going to plant some grape or cherry tomatoes so I can have them in salads a LOT sooner! LOL! I have to pick them just as they start to turn reddish or else they become Mr. Groundhog's lunch and not mine. Can't find that recipe? Google a couple of ingredients and you'll find it or something very close.